The first-term senator likes his chances. "We've had some very good successes, and we'll continue to tout that environmental record," Gardner told E&E News. He pointed to actions on creating new recreation opportunities in Colorado, protecting clean energy research at the Department of Energy's National Renewable Energy Laboratory, fighting for the solar industry and boosting energy efficiency for federal buildings. "The left wants to ban oil and gas," he said. "And I have friends and neighbors and an entire state that benefits from oil and gas production." Sen. Todd Young (R-Ind. ), who is charged with getting GOP senators elected as chairman of the National Republican Senatorial Committee, said he, too, is happy with Gardner's chances. "I'm very confident, because Sen. Gardner is an exceptional candidate with a record of achievement behind him. He reflects his state very well," Young said, singling out Gardner's "instrumental" role in getting the lands package passed earlier this year. "That said, we do know that it's a battleground state, and he's ready for battle." The Colorado race is likely to be one of the most high-profile in the country in an election cycle expected to be highly polarized and energized. This is in no small part due to the political swinging nature of the state and Democrats' quest to take the Senate majority. And energy and environment issues may be pivotal. As Gardner is asking Coloradans to give him a second six-year term in the upper chamber, he's framing his record as one of protecting public land and clean energy, while fighting back on what he describes as socialist attempts to shut down the oil and natural gas industry that's vital to the state's economy. But Gardner's opponents, including environmentalists and some of the eight Democrats vying in a primary to run against him, argue he's cozied up to President Trump and the fossil fuel industry while highlighting inconsequential conservation victories. "Coloradans have demonstrated over and over that they want leaders who don't just have rhetoric on protecting public lands and moving forward on wind and solar energy, they want to see action on that," said Pete Maysmith, senior vice president of campaigns at the League of Conservation Voters. The group, which overwhelmingly backs Democrats for elections, gives Gardner a 10% rating on its environmental voting scorecard. 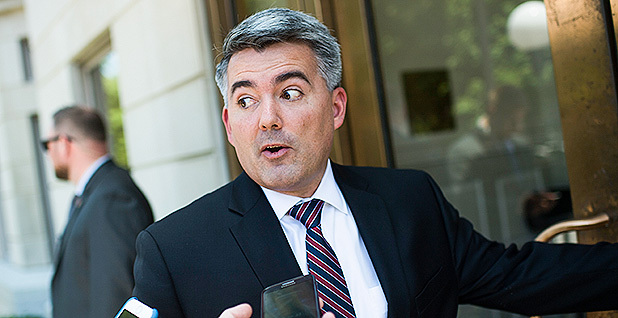 "Sen. Gardner's fallen woefully short of the mark, and he's going to have to answer to the voters in 2020," Maysmith said. "He has been doing nothing but pandering to the oil and gas lobby and big money," said Lorena Garcia, a former nonprofit executive and first-time political candidate running in the race as a Democrat. She highlighted Gardner's outspoken support for David Bernhardt, a former oil lobbyist whom the Senate confirmed yesterday to lead the Interior Department. "That's only because he believes he's the perfect person to continue leasing out lands for oil and gas exploration and for fracking," she said. "He does not at all consider science, he doesn't consider people, he doesn't consider anything except his own political career in every decision that he makes." Gardner previously served in both the U.S. House and the state House before unseating incumbent Sen. Mark Udall (D) in 2014. Since his election, he's presented himself as a supporter of renewable energy including wind, which is a major industry in Colorado, and for protecting federal lands. He shot a campaign advertisement at a wind farm and promised he'd be the state's best champion for the industry. Gardner has supported extending and phasing out the federal tax credit for wind energy — after first voting against a nonbinding measure that would have extended it for five years — and fought for a major federal lands protection package in December, including angrily confronting Sen. Mike Lee (R-Utah) on the Senate floor, declaring he was "pretty darn upset" after the Utah lawmaker blocked it from quick passage. Despite representing a moderate state where numerous Democrats flipped GOP seats in last year's midterm election, Gardner has aligned himself with the Trump administration in many instances, including supporting administration and judicial nominees and coming out in support of Trump's re-election. "He essentially wrapped himself around Donald Trump, and Donald Trump isn't very popular here," said Robert Duffy, a political science professor at Colorado State University. "I don't see signs of Democratic enthusiasm or hatred of Trump dissipating enough to help Cory Gardner," he said. "But November 2020 is a ways away, so things can always change." As a sign of Gardner's status in the state, The Denver Post apologized last month for its 2014 endorsement of him against Udall, declaring it a "mistake." Gardner makes no apologies about his support for oil and gas, for Bernhardt, or for many of Trump's energy policies, including his aggressive rollbacks of environmental policies. Taking a page from Trump and other national Republicans, Gardner is framing energy in the campaign as a battle between socialism and jobs. Many of his Democratic opponents support the Green New Deal, and he's an outspoken opponent of it. "What the left wants to do is, through socialism, destroy jobs and the economy. They want to, in 10 years, put every single worker in the oil and gas fields out of work. They believe it is their place to decide there's a better job for them," he told E&E News. "I think we can work through good policies like wind and solar investments and research opportunities that will boost the economy, grow the economy, while reducing emissions and addressing our environment concerns." Gardner noted Bernhardt will be the seventh Interior secretary native to Colorado, and every Colorado senator voted to confirm the last six. Sen. Michael Bennet (D-Colo.), a likely presidential candidate, broke the streak yesterday with his vote against Bernhardt. He's also sought to differentiate himself from Trump on energy at times, including fighting proposed cuts to renewable energy spending that would hurt the National Renewable Energy Laboratory in his state. Although no clear frontrunner has emerged in the Democratic primary against Gardner, former state Sen. Mike Johnston raised $1.8 million in the first quarter of the year, an impressive figure for a Senate race. Gardner topped him, however, bringing in $2 million. "President Trump denies that climate change is real, yet Cory Gardner stands behind him, and has actually voted to make this growing threat to our country worse," Johnston said in a statement to E&E News. "Coloradans want real action on climate change, and in the Senate, I will run toward this issue to offer real solutions, unlike Cory Gardner." Johnston has published his own version of the Green New Deal that aims for a 100% renewable electricity grid, similar to the proposal from Rep. Alexandria Ocasio-Cortez (D-N.Y.) and Sen. Ed Markey (D-Mass.). But his plan puts a 2040 deadline on the goal, less ambitious than the 10-year time frame put forward by Ocasio-Cortez and Markey. Other candidates do support the more well-known version, including Garcia and Andrew Romanoff, a former state House speaker. "In my view, a Green New Deal is, in some ways, our last best chance to rescue the Earth. And Cory describes it as a lot of red tape," Romanoff said. "The good news is, most Coloradans are not where he and President Trump are. So the challenge in the election will be to spell out the differences." Other Democrats are backing ambitious climate policies, including rapid decarbonization. "As senator, my job would be to make sure that we are doing justice for the generations to come, which means getting us off of fossil fuels, making sure that we are energy independent as a nation, making sure that are investing in solar, in wind, in hydroelectric energy," said Stephany Rose Spaulding, who ran unsuccessfully for the House last year. Diana Bray, a climate activist and psychologist, is making climate a major part of her bid. "It's no coincidence that while Cory Gardner has been in the Senate, the oil and gas industry has run rampant across Colorado; his voting record explains why," her campaign said in a statement. "Diana is running because we need to take bold, innovative action to protect against the looming threats to our economy and environment." Larry Sabato's Crystal Ball, a project of the University of Virginia politics professor, rates the Colorado race as a "toss-up." It's also a must-win if Democrats, who have 47 of the seats in the Senate, want to be in the majority. "The president lost Colorado by 5 points in 2016, and he's an underdog to carry it in 2020. That very fact puts Cory Gardner in considerable jeopardy," said Kyle Kondik, managing editor of the Crystal Ball. "He is a strong candidate and campaigner, and we'll have to see who the Democrats nominate. But most people seem to think this is the best takeover opportunity for Democrats in the Senate, and it seems very likely that it will be hotly contested."